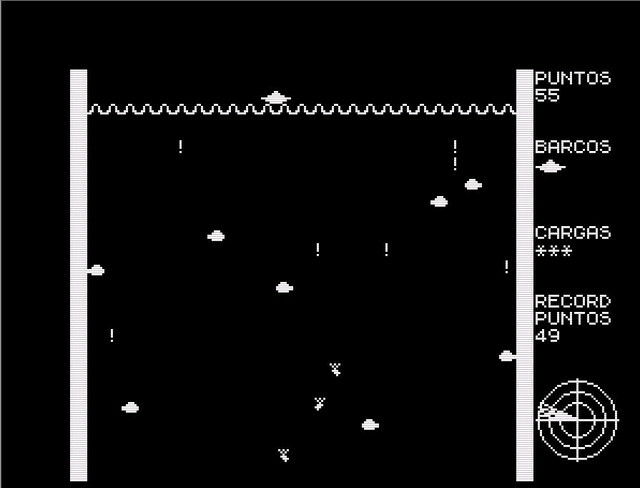 Thanks to some spare time, I had the opportunity to retake the speccy programming, so here is my last creation: a clone of the Depthcharge arcade game. Nothing fancy, but at least I could have some fun developing for ours old but reliable Spectrums. Game mechanic is simple: move your ship left and right and drop charges to destroy submarines, while avoiding their missiles. Number of submarines and missiles can be chosen at each game start. Hope you enjoy and as always, any comments are welcome. Cheers! Very nice little fun thing. Good job. Which saves a lot of maths and division. If you want to divide by 50 to get whole seconds, you can do it outside the function - but generally, I found t() returning clock ticks and working with them as 50 times larger meant I have more precision on where I launch events. (Instead of at 1s, 2s, 3s, I go 50 frames, 100 frames, 150 frames - and then if I want to I can tweak that to 40,80,120 much more easily). So to get t you do a lot of stack work, then divide by 50 - and then divide by 30. I think I'd do it as frames and divide by 150 in one go when setting a, which is probably shorter than running the full division twice. Anyway. Just my thougts. The game is quite fun Never enough depth charges. britlion wrote: Very nice little fun thing. Good job. Besides, I updated the game with a few improvements: sonar is now draw OK , added a minor visual effect on it, load screen and intro music. And the inlays, shared with my other Escape game. But the function, what returns? The sum of all values? And why load a zero value into D? Sorry if they are basic ASM questions, but my knowledge of ASM and the Z80 are almost none. It won't be perhaps as fast as the ASM. Can you check it? Tested and it's way faster than ASM; in fact, I can't control the speed of the sonar pointer. With the ASM function, I can do that changing the 360 in a = t1 / 360 * PI: REM a is the seconds pointer in radians line. Ups, sorry. For the PEEK, it's in 1/50th of second. You have to divide by 50 to get the real value in seconds. I thought the ASM one was pretty optimal - I can't see how to do it faster. I must check that. Are you sure it's working correctly (if too fast) with it? DI - disable interrupts. Just for a moment, it stops the clock. This means it can't tick mid measure. Technically it will lose a frame very very _very_ rarely, but in practice nobody would notice. It's a safety device to make all the bytes consistent while we read it. LD HL, (23672) loads H with (23673) and L with (23672). EI - Put interrupts back. We've got our numbers. Since the function returns a uLong, which is 4 bytes in DEHL, it returns this number. Boriel's peek method is technically not interrupt safe, by the way, though the probability of an interrupt hitting right in the middle of those small set of instructions is fairly low. That said, it's going to happen eventually. Last edited by britlion on Sun Dec 09, 2018 6:19 pm, edited 3 times in total. Doesn't that peek band 63 (FFFFFF) mean that it only returns numbers from 0-63 ? That's a bit short. It rolls over every second and a bit, surely? Shouldn't it be peek band 0xFFFFFFFFFFFFFFFFFFFFFFFF ? Surely this is 50 times too fast? My t() function returns FRAMES, not seconds - so it returns 50ths of a second as a count. You are right, my mistake :-S I really wanted to say I didn't know to implement/control the code provided by boriel as opposite as yours, what works "as is", without any modification.